two years ago this shot would have been almost impossible with a DSLR. 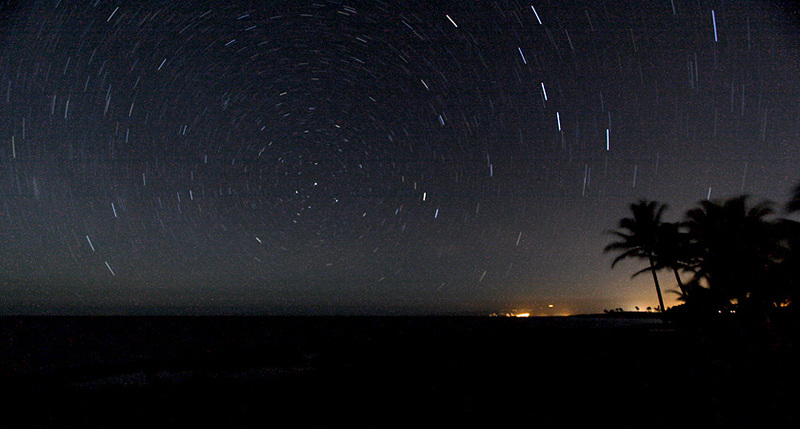 25-minute exposure, canon eos 50D on an EF-S 10-22mm lens. f/14 at 25 minutes, ISO 100.
star streaks. yeah its noisy as hell but its at least usable. no post production or despeckling, straight crop off the camera. just amazing. last time i tried this with 35mm velvia slide film it turned out a little bit better. but only a little. 26 Jan This entry was written by aaron, posted on January 26, 2009 at 12:00 pm, filed under scenery and tagged astrophotography, kohala coastline, long exposure, night photography, stars, streaks. Bookmark the permalink. Follow any comments here with the RSS feed for this post. Post a comment or leave a trackback: Trackback URL.